Have you been to McCormick & Schmick’s Happy Hour before? The bar area at McCormick and Schmick’s has a special happy hour menu with prices ranging from $2.99 to $5.99. My favorite deal is the cheeseburger and fries for $3.99, which is pictured above. You do need a minimum bar purchase of $3.25 to participate in happy hour. McCormick and Schmick’s has two Boston Location at Faneuil Hall and Park Plaza. The Happy Hours at both locations are slightly different with different menus and times. 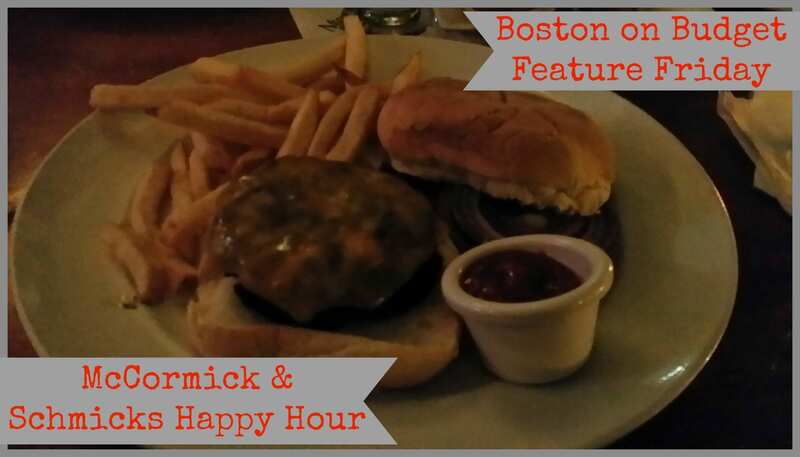 The Happy Hour at McCormick and Schmick’s at 1 Faneuil Hall Place is Monday-Friday 4pm-6:30pm with a great happy hour menu. The Happy Hour at McCormick and Schmick’s at 34 Columbus Ave is Monday-Friday 4pm-6:30pm and 9-11pm and Saturday 10pm-12am with a great happy hour menu. Have you been to the happy hour at McCormick & Schmick’s? Do you have a location preference or favorite meal?